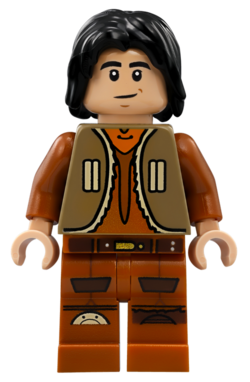 Ezra Bridger is a Star Wars Rebels-themed minifigure first released in 2014. The back printing of Ezra's torso and his alternate face. Ezra has a dark orange leg piece, with a printing pattern consisting of a brown belt on the leg joint with a gold buckle and silver and gold studs, brown pockets on the upper parts both legs outlined in black, the top of a brown kneepad on the left leg, and the curved top of a piece of grey leg armour on the right. Ezra has a dark tan torso piece, representing his short-sleeved jacket. The piece has dark orange arms for the clothing he wears underneath the outer jacket, and flesh-coloured hands. The back of the torso has tan lining at the bottom of the piece outlined in black, with a tan-coloured logo in a circle dominating most of the area in the centre. At the top is a dark orange with the bottom part outlined in black, representing the inner clothing. Meanwhile, the front of the piece depicts an open jacket with tan lining and outlined in black. At around the middle of the jacket are four tan pockets outlined in black, two on either side of the jacket's opening. The centre area of the piece is dark orange, with an orange area at the top, depicting the clothing worn under the jacket. Black lines are present in this area, representing seams and creases. Used with a long black hairpiece, Ezra has a double-sided, flesh-coloured head. The side most commonly shown features black eyebrows, black eyes with white pupils, a black lopsided smile, and darker flesh lines for facial outlining. The other side retains most of these features, but has a different expression, with the left eyebrow raised and an open mouth showing white teeth. On his first release in 2014, Ezra came with two accessories- a black blaster pistol, and a white Imperial cadet helmet with black and dark grey printing, a piece which is currently exclusive to Ezra. In 2015, in place of a blaster pistol, Ezra comes armed with his own blue-bladed lightsaber. Instead of a regular lightsaber hilt, Ezra's lightsaber uses a piece commonly used for binoculars, with a blade extending from one of the two holes. This is due to the shape of Ezra's lightsaber in the Star Wars universe, which features a blaster pistol built into the hilt. In addition to the lightsaber, Ezra also comes with a black spanner. 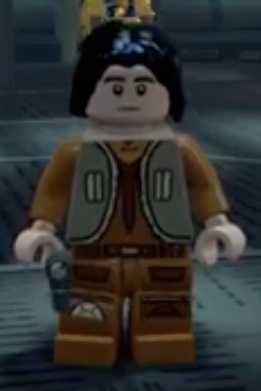 Ezra Bridger in LEGO Star Wars: The Force Awakens. Ezra Bridger was a Force-sensitive who lived on the planet Lothal. Five years before the Battle of Yavin, Ezra encountered the a group of rebels who were stealing supplies from the Empire, and, growing up as a thief, decided to steal an Imperial crate for himself. However, after coming under attack from a TIE Fighter, Ezra was forced to escape with the Lothal rebels aboard their ship, the Ghost. Ezra spent some time with the Rebels, including delivering the stolen Imperial supplies- weapons to a black market arms dealer for credits, and handing out food to farmers on Lothal who were living in poverty due to the Empire taking their land and homes. He then went on a mission with the rebels to free Wookiee prisoners- at one point he was captured by Imperial forces, but the other rebels returned to save him. The team went to Kessel to save the Wookiees, and it was here that the team's leader, Kanan Jarrus, revealed himself to be a Jedi, taking on Agent Kallus and a squad of Stormtroopers with his lightsaber. After the mission, the rebels returned Ezra to Lothal. However, Kanan offered him a place in the team, and to train him in the ways of the Force, an offer Ezra eventually accepted. Along with the five other members of the team, Ezra went on several missions, usually involving stealing Imperial weapons and supplies. An Imperial cadet helmet Ezra stole and wore to listen in on Imperial communications. Ezra with his blaster pistol. This page was last edited on 1 October 2016, at 09:49.